We had the opportunity to visit the sets of this new show based on the Terminator franchise! A 5 parts report from a visit in Vancouver and the sets of Stargate! Firstly, I would like to thank Greg (aka Mikala) and Azusa for having invited me to stay at their apartment during all my journey to Vancouver. In this report you will not only discover the city and its surroundings but also some places of the city used in many TV shows, such Stargate, Galactica, The X-Files and Blade. My first day in Vancouver was a wonderful sunny day, as all the days where I was staying in the city. After a first tour of the streets of downtown, I was pleased to discover so many familiar places ... such those stairs where Richard Dean Anderson and Amanda Tapping took to the street in Washington in episode 2x09 "Secrets" from Stargate SG-1. At the bottom of those stairs, you can see a place with some shops and a covered place (the street is up!) where teenagers are doing skateboard. 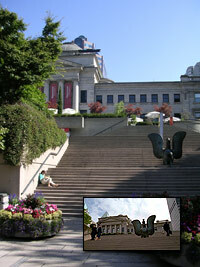 And up the stairs, what is supposed to be a government building is a simple museum (The Vancouver Art Gallery)! While walking around this place, we saw scaffolds with people putting lights on the inside of a building around this place ... they were shooting something! 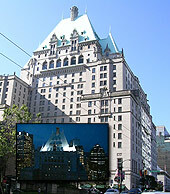 A few streets from there, we could see the "Vancouver's Fairmont Hotel" that the fans of "Blade - The television series" will recognize as the house of Marcus Van Sciver. Supposed to be a place in Detroit, that building rises in the heart of Downtown Vancouver! No vampire there, just a place for people to stay while they are in the city! 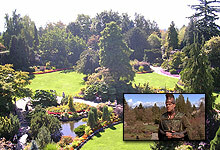 The next place was Queen Elizabeth Park, around 15 minutes from Downtown Vancouver, this wonderful place was used in episode 2x04 "The Gamekeeper" of Stargate SG-1 as the garden of the Keeper. 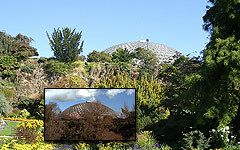 In this garden, you can also see the Bloedel Floral Conservatory used in the same episode as the dome where SG-1 was captured and pulled against their will into a virtual reality world. A wonderful garden! 2 just-married couples were having a photo session while we were discovering this place! The place for "The Gamekeeper"
Walking on the streets on the sunset, I was pleased to discover the English Bay, the place from where you can see the landscapes in Baltar's dreams (Galactica) and supposed to be Caprica. You can't miss it while you are in Vancouver. Sunday was again a sunny day and I took this day to walk around all Downtown on the sea side, it was a good day for walking. 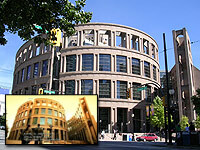 But firstly, I walked to Vancouver Public Library to see the place used in Battlestar Galactica, episode 1x03 "Bastille day", in the beginning of the episode, where Sharon and Helo try to search for survivors. All that place reminds you Caprica, you can recognize some buildings seen in large shots of Caprica. 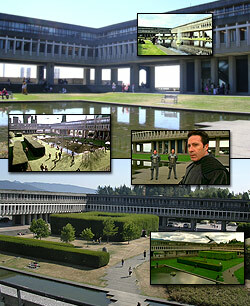 Actually, all Caprica city is Downtown Vancouver! Back at SFU (Simon Fraser University) on Monday morning, still cosplayers and the convention .... Annoyed of coming here again for nothing I decided to do a lot more photos of the place and even going up on the building to try to take a global view of the "Academic Quadrangle". What I didn't know at this point is that my friend Eric Chu (Galactica mini-series designer) was there the day before .... Well, I met him the next day at his office. The afternoon was a visit of Stanley Park, a huge park at the edge of the peninsula of Downtown. I was even able to have a swim in the ocean, the sun was hot and the view beautifull! What a cool place, you have the mountains, forest and even the ocean where to swim in the summer. Some people will say that the ocean is cold but it was ok for me! I had to come back at the appartment at 5PM to place a phone call to Bridge Studios for my visit of the following day. The visit is scheduled for Wednesday but I had to call back the following day for a confirmation. 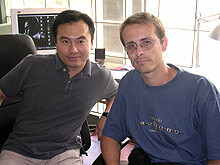 Tuesday was my first meeting with Eric Chu, designer of Battlestar Galactica, the mini-series. We had a lunch and talked a lot about things and others, then went at his studios where he showed me a lot of sketches from Galactica, original conception sketches, final versions and much more. Then he draw me a cylon (see here) and in exchange I had to draw him a Cylon too! It was nice to finally meet him! 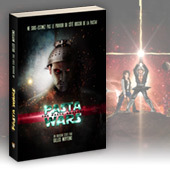 You can ask him questions in TSW forum here! Then my second appointment of the day was a few blocks from there, Rainmaker Studios! I will give more details about this visit in Part 3 of this report. And finally my most anticipated day arrived: the visit of Stargate sets!! I had the opportunity to visit an external location and both studios of SG-1 and Atlantis! You'll get a full report in Part 4. Next day, Thursday, I had an appointment early in the morning with Kevan Ohtsji, you will recognize him as the first jaffa of Lord Yu in several episodes of Stargate SG-1. 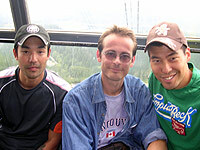 We were going for a hike, the Grouse Grind at Grouse Mountain, also known as The Peak Of Vancouver. This rigorous 2.9 km (1.8 mile) hike takes you straight up the face of Grouse Mountain. By the time you reach the plateau, your ascent will have gained 853 metres (2,800 feet)! All stairways from the bottom to the top of the mountain! There, we had an appointment with 2 friends of Kevan, including Warren Takeuchi (playing Kitaro Sasaki in "Babylon 5: The Legend of the Rangers"). It was .... hard .... (no more comment). It was the first day without sun and actually very foggy, good time for a hike but NOT good time for the view at the top of the mountain ... I wasn't able to take any landscape photos from there, all was completely white! But it was a good challenge, and I did it!! Then back with the cable-car until the bottom! I seemed like just getting out of my bath! Friday was my appointment with our favorite Prior: Greg Anderson, at Lonsdale Quay at a boat drive from Canada Place. We had a very good time and a lunch with his son and a friend. Unfortunately he was busy so we hadn't too much time togheter but I recorded a video message for all of you: Hallowed are the Oris! (coming soon). Oh, and Greg asked me an autograph ... that was a funny moment, we exchanged our autographs! 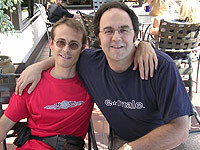 Saturday was a long awaited meeting: with my friend Mitchell Kosterman! 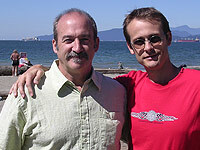 We had a lunch at a restaurant in front of English Bay, and we also exchanged autographs! We took some photos and then went to Mount Seymour for a view of the city and its arounds. And during the drive, we saw several cinema studios, such "The Lions Gate Studios", one of the biggest. They were filming a movie with Pierce Brosnan, but unfortunately the studios were closed for the week end. And came the last day .... it was way too short! But I'll be back!